Should Joe and Anthony Russo remain loyal to “The Infinity Gauntlet” comic, Nebula may well become the true villain of Avengers 4. 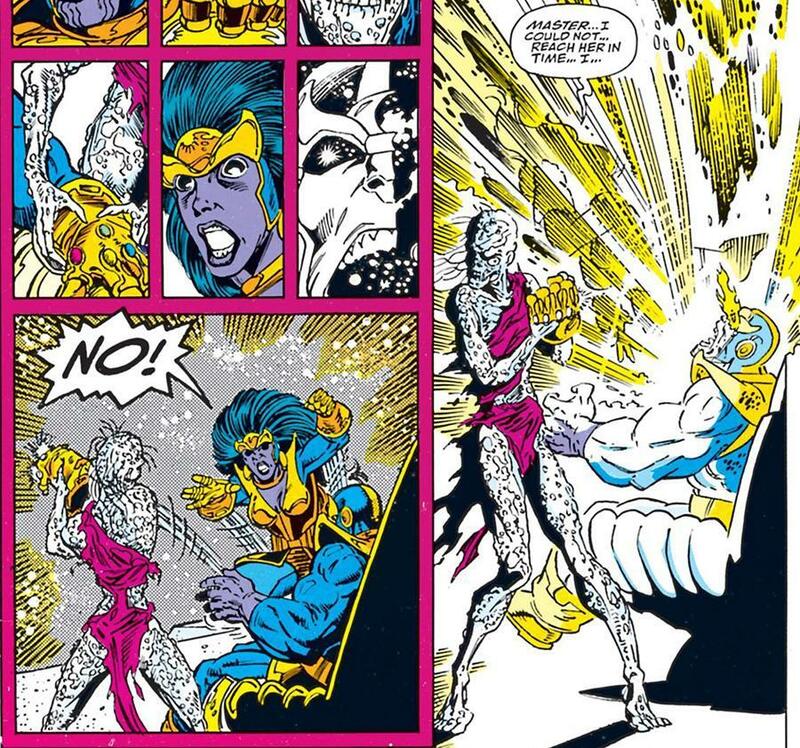 As ComicBook.com points out, Jim Starlin’s beloved source material heralds the moment when Karen Gillan’s blue-skinned oddity comes face-to-face with her abusive father, Thanos (see below), who quickly becomes a victim of his own hubris once he’s successfully acquired all six Infinity Stones – namely Power, Space, Time, Reality, Mind and Soul – and restored balance to the universe. His rationale? Population control, essentially, though the Mad Titan’s mass genocide is enough to prompt Earth’s Mightiest Heroes into action. Nebula, meanwhile, is subjected to a great deal of physical and mental torture during “Infinity Gauntlet” – more so than Avengers: Infinity War – to the point where she’s reduced to little more than a walking zombie, trudging through the universe in search of revenge. In doing so, the unlikely ensemble agrees to place the Infinity Gauntlet in the custody of a trustee: Adam Warlock, who ultimately separates each cosmic gem so that no further harm can be caused – either by Thanos or Nebula. Mind you, it’s worth pointing out that Avengers: Infinity War was only loosely inspired by “The Infinity Gauntlet,” so there’s no guarantee that the so-far untitled Avengers 4 will stay true to the comics. But Nebula was one of the few characters left standing after Thanos snapped his fingers, so perhaps Joe and Anthony Russo will concoct their own brand of revenge for Karen Gillan’s supporting player.